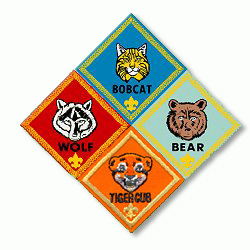 The Cub Scout program is chuck full of opportunities to recognize the achievements of your Cub Scouts. This training handout is not even close to a comprehensive list of all the recognitions possible. Instead this is a starting point for learning about the wide variety of awards available. For more information on specific awards visit our Awards Page. If you use this as a template for making a training handout in your own District, please insert a list of local hiking trails here and note their location, cost, times of operation, availability of patches and medals and other related information.